Coinciding with Universal Brotherhood Day, the academic session of Classes I and II at Sishu Vidya Mandir under RK Mission School began at Lumdung in Seppa on Tuesday. The classes will be functioning temporarily from Government Middle School, Lumdung. Attending the inaugural function, local MLA Mama Natung exhorted all stakeholders to shoulder responsibilities for the betterment of the education sector and requested them to go the extra mile collectively for the socio-cultural and educational development of the district. Recalling the contributions of Swami Vivekananda in shaping the world view towards education, Natung enlightened the gathering about the impact of his philosophy on education and affirmed that education plays a vital role in making a nation strong. Natung urged the people to give importance to better education of their children. He reiterated that education is the most important social sector that the development of any society is dependent upon. “A nation cannot be made strong by arms and weapons but through education only. Education is the basic building block of foundation for any society to become developed. Until and unless this sector is developed, the mentality of the people will not be developed and hence, the society will not be developed,” he said. Pronouncing that education is the only mantra to resolve any problem, he added that everyone should participate and extend all possible assistance in achieving the true goal of the education. Stating that “every person in this world has some duty and responsibility and he should try to perform these duties,” he exhorted the students to be disciplined in life and follow the ideals of Swami Vivekananda. Pinning hope that the school would produce many successful individuals in the near future, he requested the teaching fraternity and the school authority to impart good and quality education, which are relevant to the changing environment. Stressing the importance of education for a better tomorrow, he further said that the dream of setting up of an RK Mission has been realised due to many individuals who contributed and toiled hard for the same. He thanked Arunachal Pradesh Chief Minister Pema Khandu and his Team Arunachal for their constant support and cooperation and to the villagers for reposing their faith in him. Highlighting the works and achievements of RK Mission, Swami Divyanandaji Maharaj urged everyone to introspect the true meaning of the messages of Swami Vivekananda who saw the world as one single big family whose members needed to care for each other. He exhorted the people, irrespective of religion, to subscribe to the ideology of humanity, love, peace and tolerance which is underscored as the only solution to all hatred and chaos in this era of Kalyug. Briefing about the importance of education, he thanked every individual for their support in establishment of the RK Mission School and urged everyone to extend their cooperation in future for smooth operation of the school. He further said that the foundation stone for RK Mission School to start the higher secondary level will be laid soon. East Kameng DC Gaurav Singh Rajawat underscored the importance of education and said that education makes a person to become champion of cause of justice and contributor in overall development of the society. Hoping that the RK Mission School would be a game-changer in terms of socio-economic and cultural development of the area, he appreciated the yeoman’s services being provided by the teachers in bringing changes in the society and simultaneously urged the faculty members to encourage, motivate and impart quality education to the students. Rajawat exhorted the students to accord top priority to study and urged them to stay away from bad habits and anti-social activities. Former Minister Hari Natung, Swami Sarvagananda and East Kameng SP Vikas Kumar also spoke on the occasion and narrated the speech delivered by Swami Vivekananda at the World Parliament of Religion in Chicago, where he proposed and advocated the idea of universal brotherhood. A statue of Swami Vivekananda was unveiled and garlanded at the event. School bags were also distributed to the new and first-batch students of the school. 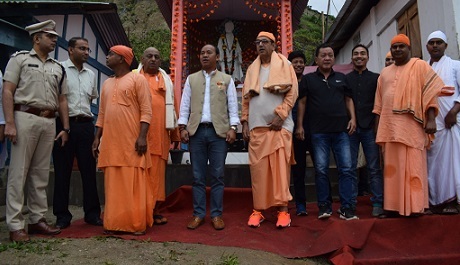 HoDs, teaching fraternity and staff of both Sishu Vidyamandir and GMS Lumdung, students and parents, public leaders, and locals were present to witness the historic event.